OK, the time has come to unveil my Hack for Yahoo Hack Day. 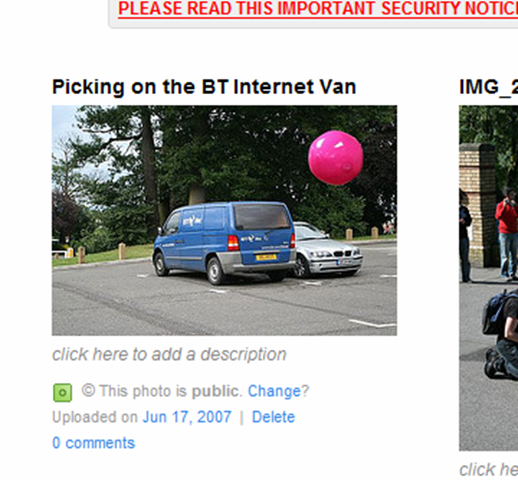 Face Ball is the ‘Crazy new game at Flickr HQ‘, and images have been popping up all over flickr as other join in. Well now, you too can join in the fun, and just like Thom Shannon, make your own Face Ball images without risk of injury or special equipment. 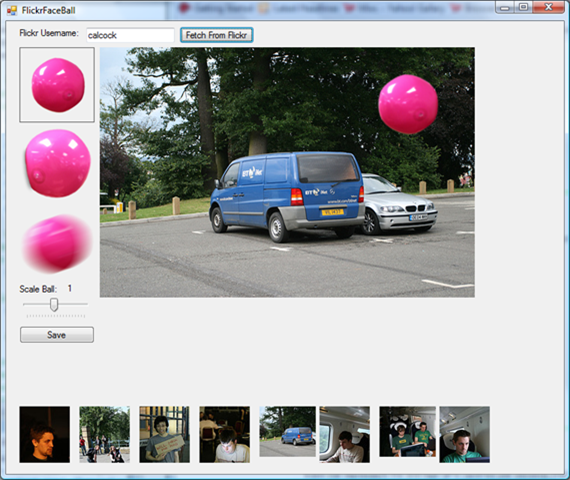 Flickr Face Ball is a .NET 2 Windows Forms application that allows you to select images from you Flickr photo stream by tagging them as ‘ToFaceBall’, and add one of three different face ball images to the original photo, uploading the results to your Flickr account. Ensure you are running Windows with the .NET 2 framework – sorry Mac guys – this one probably isn’t for you. Wait patiently while it loads the images. 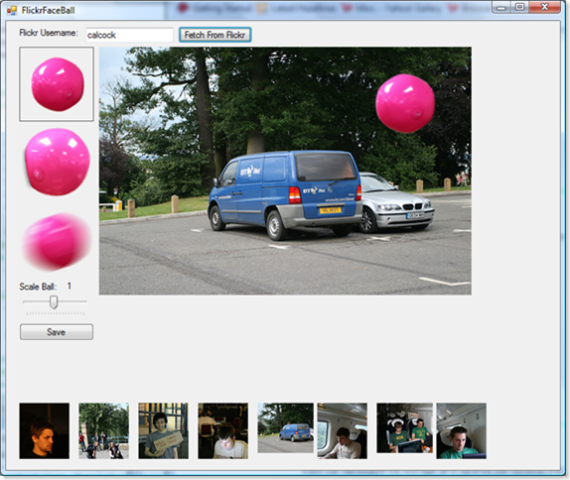 Choose an Image from the thumbnail strip at the bottom of the screen, choose a ball from the pallet on the left, and click on the image to position it. When you have achieved the look you want, click save, enter a title and description, followed by Authenticate. When prompted in your browser, please allow the application to upload the images. Finally, click upload, and (hopefully) your creation will be be uploaded to your flickr stream. Thom Shannon for providing the inspiration for the Hack, and also providing the PSD of face ball images. Please Note: This program is hack quality code – It’s not been tested much, and if it breaks your computer, flickr account, or anything else, its your own responsibility. Day 1 was certainly eventful, and now with <2 hours sleep (and one completed Hack) under my belt, I’m ready and raring to go for Day 2. The Music in the West Hall went off at about 6:30, about the same time I woke up, and now all that remains is the subdued noise of people waking up (and a few who must be attempting not to fall asleep in their laptops. The count down clock on the big screen reads a little more that 6 hours hacking time remain, and I’m beginning to wonder if its time I went to try to wake the other members of the team. The Liverpool members of the team (Myself, Mike, Derek, and Thom)assembled at Lime Street station with blury eyes for the 6:07 train to Euston. Reports indicate that Sunny has made it to his train from Manchester too, so hopefully we should all converge at Euston. Attempts on the train to get us all networked and sharing a single Internet connection failed abysmally, mainly due to my laptops refusal to see any one elses. Some of the guys managed to get in a little bit of gaming along the way, lighting up the carriage with the sounds of Grand Theft Auto – I’m sure that the other occupants really enjoyed the sounds of their mega violence. Yesterday, we got our hosting for our Hack set up ready, and the team blog is also configured. Hopefully by the time we arrive the domain will have successfully registered and be pointing to the right place.